These key tags are 5cm long and 22mm wide. Each keytag includes a 18mm split ring. 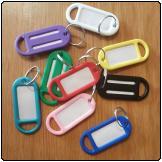 The key tags come in black, white, yellow, red, blue and green, pink, purple and turqoise. Please note that we will send a variety of different colours when you order unless you specify which colour you need specifically.